HCPT – the Pilgrimage Trust – was started by a doctor, Michael Strode, who later became a religious Brother. He felt that unwell people coming to Lourdes should be treated just as “normal”, staying in hotels rather than hospitals, having fun in the town of Lourdes, and taking part in all the beautiful religious ceremonies of Lourdes. In 1954, he took four young adults with learning disability on pilgrimage to Lourdes. 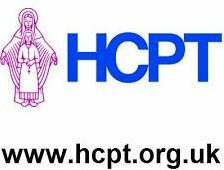 From that early small start, HCPT Pilgrimage Trust has grown to a big professional organisation. HCPT offers pilgrimage holidays in Lourdes to disabled or disadvantaged people. At Easter, over 1000 young people travel in groups with their helpers. During summer, over 1500 adults and young people travel to Lourdes with their HCPT groups. The helpers, nurses and others who travel with the children can all attest to the wonderful benefits the young people derive from their holiday with Our Lady. The experience of some of the pilgrims is described on the website of HCPT. Scottish HCPT has many groups throughout Scotland. Within St Columbkille’s parish we have members from Groups 207, 88, 89 and 116. During the year, each volunteer helper raises the price of a child’s fare and residential stay for the week. We meet regularly as a group, and train in risk assessment, first aid, moving and handling and many other areas to ensure a safe and happy experience for our young guests. We have spiritual preparation as the Scottish region on the Sunday closest to Ash Wednesday, as we prepare to leave Scotland on Easter Sunday for our pilgrimage week in Lourdes. For more information, please contact miriam.mckernan@gmail.com, or the website www.hcpt.org.uk.